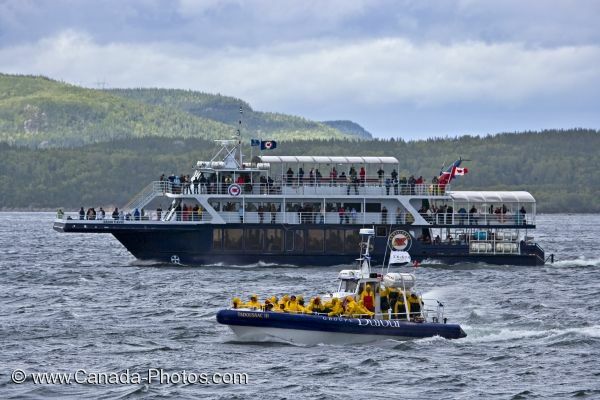 Two whale watching boats in the Gulf of St. Lawrence off Tadoussac, Quebec are loaded with tourists that are on the look out for various species of Finback Whales. In the Zodiac, people wear rain jackets to stay dry while the people aboard the larger boat have plenty of space to roam around and stay warm and dry. Whale watching boat from the town of Tadoussac, Route des Baleines, Highway 138, Manicouagan, Gulf of St Lawrence, Quebec, Canada. Picture of whale watching boats that departed from Tadoussac, Quebec into the waters of the Gulf of St. Lawrence.